Why is British lager so weak? | LAGER FRENZY! Why is British lager so weak? According to Ron’s figures, the Original Gravity of Carlsberg beer fell from 1044.5 (around 4.5% abv) in 1939, to 1035.6 (around 3.9% abv) in 1947, to 1031.6 (around 2.9%abv) in 1952. According to Carlsberg’s historian (and former chairman) Kristoff Glamann the change over to 1030 OG beer happened first in 1963. 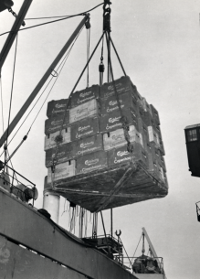 This was when Carlsberg began to export in bulk and have its beer bottled and distributed by regional breweries – the first of which was John Smith’s in Tadcaster. Up until that time Carlsberg (and lager generally) was very much a niche product with around 0.9% of the total beer market. None of the continental lagers owned pubs and needed to find some way of getting into the tied houses owned by regional and national breweries. For Carlsberg that meant agreements with around 20 breweries in England. Its easy to imagine that the high duty on imported lager, together with a small market share allowed these breweries to push alcohol content down as a way of increasing their margins. Especially as lager was a ‘refreshing’ drink rather than a ‘restorative’ in the public’s mind (and the advertisers). Not that all lager was weak though. Around 20% of Carlsberg was not brewed to 1030 OG and distribution was carried out through its own distribution companies in Edinburgh, Goole (Hull) and London. These continued to operate independently, even after the deal with Watney Mann that eventually lead to the creation of the Carlsberg brewery in Northampton. The opening of the brewery in 1973 also led to the introduction of Special Brew – the first premium strength lager on the British market, according to Carlsberg. However, I don’t have any evidence to back that up yet. This entry was posted in Brewing history, Imported lager, Lager, Marketing and tagged Beer, Carlsberg. Bookmark the permalink. 3 Responses to Why is British lager so weak? Can it also be that Carlsherg, etc adapted their products to a market that was used to session beers with an OG in the 1030’s? I’m sure that’s the case, but they didn’t do it lightly. Carlsberg put up with a £1 per barrel extra duty for a long while before biting the bullet and reducing the strength, the change was probably to do with pressure from the licence brewers. It is one of the interesting questions about lager in Britain.